Yep, you read that correctly. 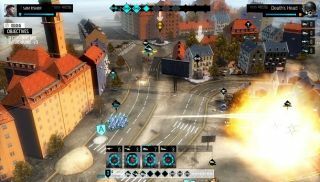 The voice-controlled RTS Ubisoft released more than three years ago on the PC is finding a war-torn home in the world of free-to-play, browser-based games. According to Ubisoft, EndWar Online takes place 10 years after the first game, with your faction of choice fighting for dominance in the smoldering aftermath of World War 3. The lone wolves out there can stick to single-player PvE missions, but the more competitive players can duke it out against your fellow survivors in PvP. EndWar Online will use a flash-based browser plug-in to render the game within your browser. Ubisoft hasn't announced which browsers are battle-hardened enough to endure the toils of war, but the game will work on both PC and Mac. The game's also free-to-play, though Ubisoft hasn't unveiled any revenue strategies to support End War Online financially. EndWar Online creative director Michal Madej told Polygon that Ubisoft chose to create a browser-based game as it allowed the publisher to connect more players to their "Theater of War" online system than individual gaming platforms would. "The original game was on console and it was faction versus faction, but what was lacking was not everyone was connected," Madej told Polygon . "There wasn't a shared theater of war. But on browser, almost everyone has a web browser, so we can try to achieve the goal of the original EndWar of having everyone be connected." Those interested in enlisting for Ubisoft's seemingly everlasting war can sign up for the beta on the official site . You might want to stock up on gasoline before heading back to the future. Daily commutes can get a little pricey when gas is over 18 dollars a gallon.